Last week, I was teaching catechism and an idea popped into my head. Usually when this happens, I try to sketch it out on paper or enter it into my memo app on my phone. My to do list is so long so usually my newly created idea just sits on my to do list until I get to it. But my idea from last week was something I felt like I needed to make immediately. I don't know if it is because our classes our held in our church's school or if it was because I knew Catholic Schools Week was coming up, but I wanted to make this and post it so other Catholic educators could have access to it. What was my idea you ask? Catholic Saint Banners to be used in decorating the classroom, hallway, doors, bulletin boards and more. My initial idea was strictly a classroom decor type idea that was ready to print and be hung in a classroom or church. The more I thought about it and started creating, I thought, why not make a version where students could color and decorate the banner? How cool would this be if students did a saint report? They could color and decorate their saint and then at the end, string together all the saints that the students learned about in class. This black and white version is also the ink saving option. If you don't want students to color or maybe you just want it to match a certain color scheme, you could print this version on colored paper/cardstock of your choice. Then you can still add a pop of color without using colored ink. The brights polkadot version was inspired by my classroom decor set that uses the same color scheme. I love these bright colors! Green horizontal stripes is another option that gives some texture to the background without a lot of distraction from the saints. Another ink saving option would be to just use the white background with the saints in color. This gives a little bit of color and can match any classroom decor or color scheme. This one is kind of hard to tell from the picture but it is mostly purple and blue vertical stripes. A little more bold choice than the green stripes but still let's the saints pop. The primary version is fun and also adds a little texture since it has a subtle canvas texture to it. It almost looks like it is painted in some parts. Definitely a bright choice that is perfect for a school setting. I've also included a blank template for each type of background in case there is a saint that isn't included that you would like to make your own banner for. Directions for editing and adding the name in the same font are included. 1. Pick the background design you want to use. 2. Choose the saints you want included. 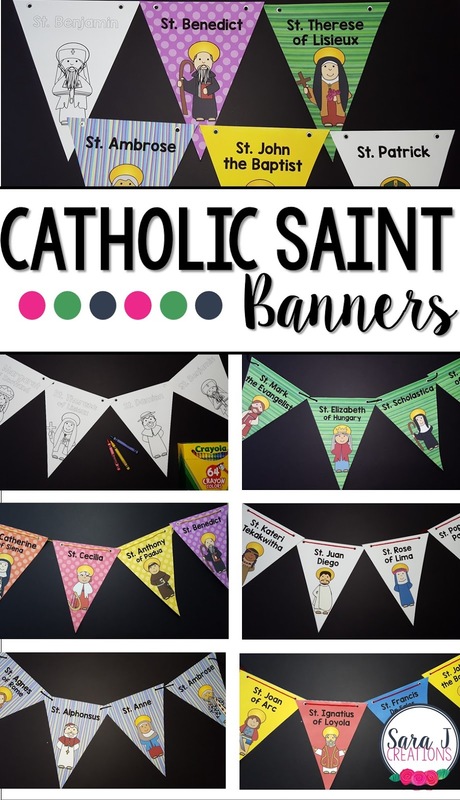 There are so many ways you can use these Catholic Saint Banners and so many options for making it work for you from choosing the background colors to including only the Saints you want included. Hurry and grab your banners now and start decorating!